Teaching online journalism requires a strong knowledge of the industry and the constant changes within it. It’s important to not only teach the medium but also to work within it. This helps me stay on top of legal and ethical issues in the industry, as well as new software tools and resources I can bring into the classroom. 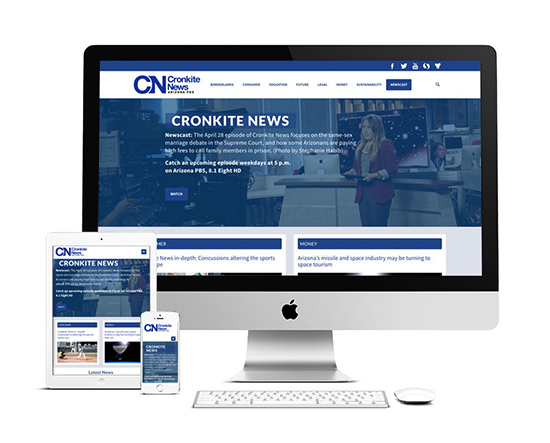 Cronkite News is the news division of Arizona PBS. My team redesigned the news organization’s website to be mobile-friendly. We used Boostrap to build the responsive site, which launched in spring 2015. Mobile/tablet traffic went from 8 percent to 56 percent in its first 10 months. The students in my digital production bureau also built graphics, multimedia and interactive features for the site, as well as compiled weekly analytics reports. The Red Line Project was several years in the making. Living in Wrigleyville and Lincoln Park off and on since 1995, I always wanted to develop a hyperlocal site that covered neighborhood news off various Red Line El stops. With news outlets cutting budgets and coverage in some of these areas, I saw an opportunity to fill that void. 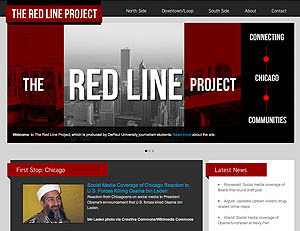 The Red Line Project was launched in February 2011 with my students in my Online Journalism II class and has been updated and maintained by graduate and undergraduate students since then. The site includes multimedia packages, social media curation, maps, links, tweets and some hard news reporting. Students are assigned various neighborhoods to cover and produce news and features. 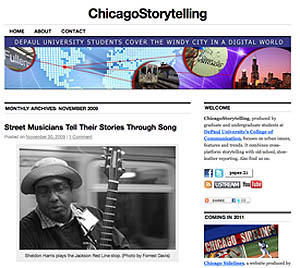 I founded ChicagoStorytelling during my 2009 summer studies at Poynter. I wanted to build a “quick and dirty” way for students to showcase their online packages for my graduate and undergraduate courses at DePaul. It mixed some long-form storytelling, multimedia with shorter news pieces. It gained some nice traction for two years, peaking at about 15,000 unique visitors a month. The site launched as a “dot-com” with coverage of Chicago’s failed Olympic bid in October 2009. I founded The Journalist’s Toolbox in 1998 as a page of links off an online syllabi I built for a Northwestern University Medill School of Journalism Newswriting class. I turned the site into a dot-com in 2000 and sold it to the American Press Institute in 2002 while continuing to update it for the organization. API sold the site (and my services) to the Society of Professional Journalists in 2008. The Toolbox now resides at SPJ and serves as a great teaching tool for newsroom trainers, college professors and high school instructors. SPJ employs me part-time to keep the site updated and interact with readers. The hours are flexible and do not interfere with my teaching schedule. Typically, the site is updated twice weekly (Wednesday nights and Sunday mornings) but I can adjust those days/times to fit my full-time work schedule. There are other updates as breaking news events occur. I built this site with a group of 16 Columbia College Chicago seniors for an Advanced Sports Reporting course I co-taught in the spring of 2009. Only three students in the class had any previous online experience (class or professional). We incorporated video, SoundSlides photo slideshows and other multimedia and tailored long-form magazine storytelling to fit in an online medium. I require students to maintain a social bookmarks site. This is my open Delicious bookmarks collection, which I use to teach students and professional journalists. My Online Journalim I, Online II and Reporting for Converged Newsrooms students contribute web videos to this channel. I was one of the 11 founding editors of the Tribune’s Web site in 1996. I served as Internet Sports Editor for two years before leaving to teach journalism full-time at Northwestern, where I had worked as an adjunct instructor. I contribute one or two blog posts a week to the NFL’s official blog site. During a seven-year span in sports marketing, I oversaw the team that developed the Bowl Championship Series (college football bowl system) Web site. The site is now maintained by FOX Sports. I also developed this site during my sports marketing career. The site played a key role in Omaha landing the 2008 U.S. Olympic Team Trials for Swimming. We built an online registration database that attracted more than 2,000 volunteers to work at the event.